I’m still getting used to the new digs for work – the West Village – and have been conducting a bit of an exploration in an effort to find new (to me) high quality food. The first “discovery” was Underground Lunch. 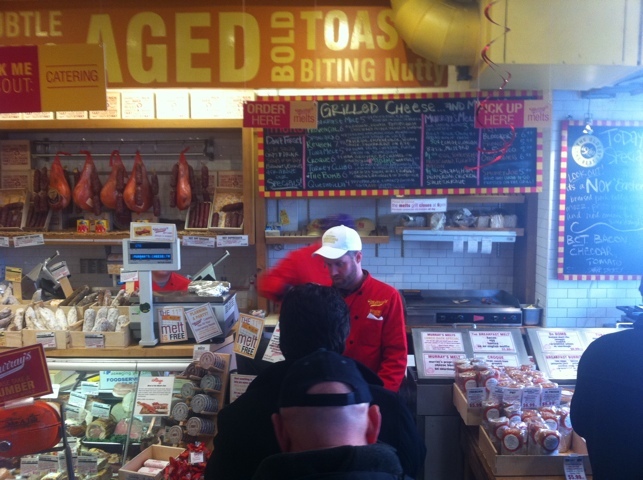 Today I sampled the sandwich fare at the well-known NY cheese institution, Murray’s. 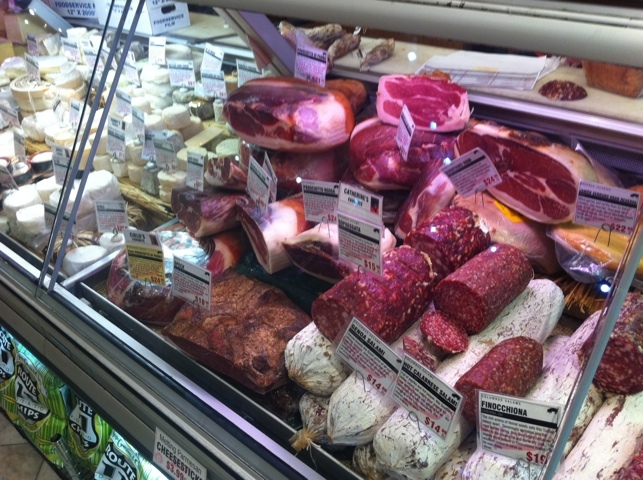 Some of the meatier fare at Murray's Cheese Shop. First of all, this is the second specialty shop named Murray’s I know, and as far as I am concerned it has a hell of a lot to live up to. It seems odd to me, to that they both have similar logos to boot… . At any rate, I was well impressed by the broad selection of cheeses within, as well as what appeared to be a winning selection of salumi. 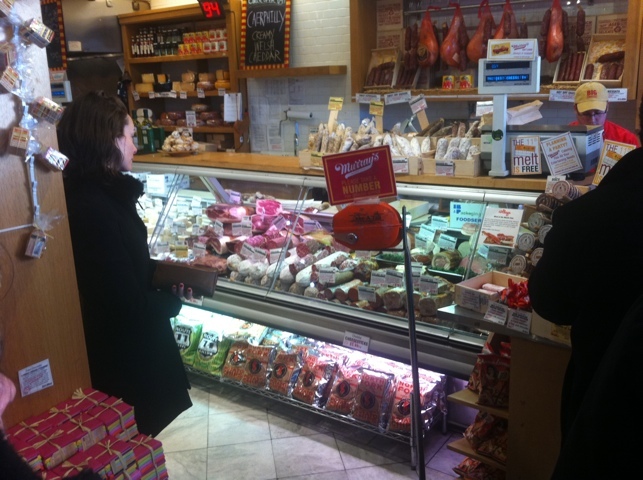 I even asked if they had that rarest of salumis, culatello (which you can see pictured behind the ME LIKE EAT logo above) but alas the answer was no. Notice the griddle in the right background. Not pictured: the presses further right. My eye was caught by the small griddle and hot presses in the corner. While Murray’s has a number of fresh-made sandwiches that are available any time, I opted for something they’d grill up then and there. My selection: a sandwich called The Bomb. 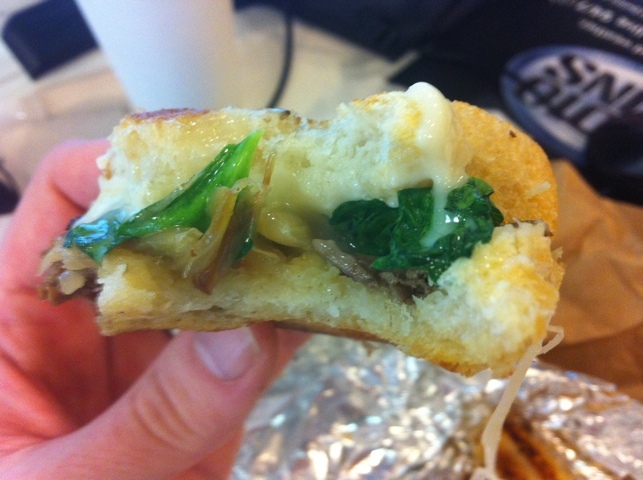 The Bomb consists of braised short rib, taleggio cheese, onion, arugula and it is served on sourdough bread. It sounded pretty tasty, so I ordered it. It clocked in at $6.99. That's it?? (Spoiler alert: no). At first I was very concerned considering what I took to be the small size of a pressed grilled cheese sandwich. I needn’t have been. 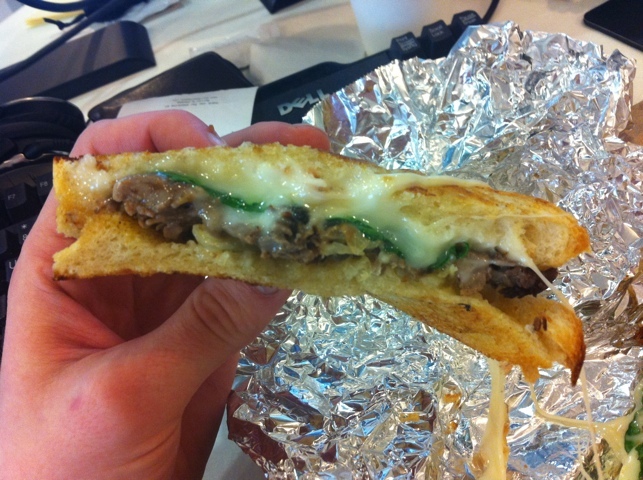 The sandwich was so rich I could barely finish it. Just look at it. Drink it in. Holy shnikes, it was freaking delicious. First let me discuss the texture, which is amazing. 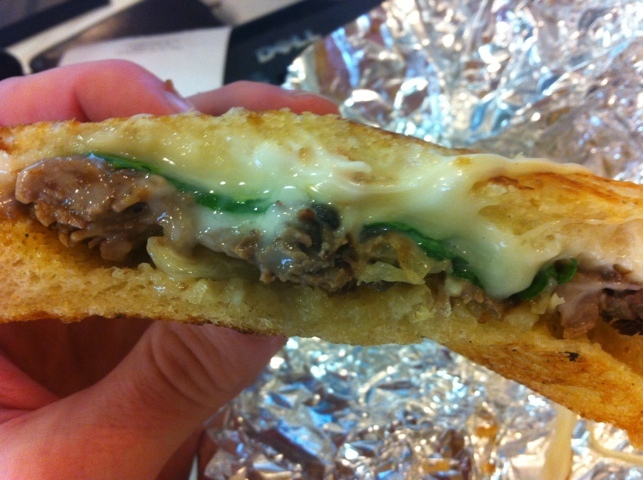 The sandwich is griddled and pressed to perfection. The toast is crispy on the outside without having a hard, flaky bark. Therefore you get an extremely satisfying crunch when you bite into it. That crunch gives way to a wonderful lake of taleggio, with chunks of braised short rib floating on occasional arugula leaves. Those bits of braised beef give the rich cheese an occasional smoky, meaty mmph that is oh-so-satisfying. Braised beef swimming in a sea of taleggio. I would put it to music, if I could. My eyes were rotating into the back of my head in bliss. 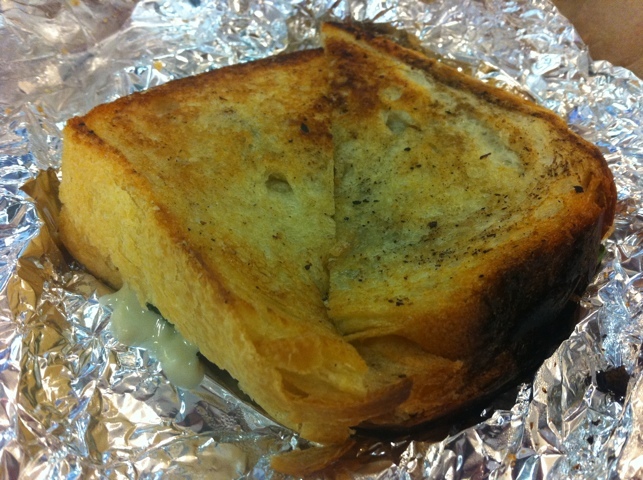 It is a gourmet’s grilled cheese sandwich. The taleggio seemed very fresh and was extremely rich and buttery. Its gooey consistency struck all the right notes: stringy without being liquid. Fun. If it looks fresh and delicious, it's because it was. Wow. Yowza! What a sandwich. Magnificent find, can’t wait to try it again, and perhaps the least dietetic thing I’ve eaten in quite a while. But hoo boy was it good. The sandwich is well-named.